How is temperature related to the gender of alligator embryos? The gender of an alligator is determined by the temperature at which the eggs are incubated. High temperatures of 90 to 93°F (32–34°C) result in males; low temperatures of 82 to 86°F (28–30°C) yield females. This determination takes place during the second and third week of the two-month incubation. Further temperature fluctuations before or after this time do not alter the gender of the young. The heat from the decaying matter on top of the nest incubates the eggs. 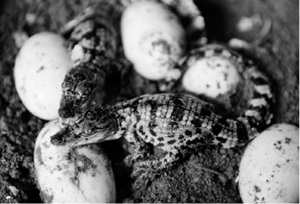 The temperature of alligator eggs influences the gender of the hatchlings. Warmer temperatures result in more males being born, and lower temperatures causes more females to develop in the embryonic stage.